Click on the links to the right to view car club activities or shows covered by Cars On Line's local writers and photographers. Auburn, IN | Aug 29-Sept 1 -- See Cars On Line's coverage from the Auburn Fall Collector Car Auction. Every year hundreds of Auburns, Cords and Duesenbergs journey to Auburn to participate in the event. Milwaukee, WI | August 24-25 -- Cars On Line.com was there as the Professional Car Society held their International Meet for the first time in Milwaukee, WI in conjunction with the Milwaukee Masterpiece Car Show. Carlisle, PA | August 23-25 -- See Cars On Line's coverage from Corvettes at Carlisle where an estimated 5,000 Corvettes were on display. Bob Boberg of eClassic Autos.com shared his photos from the event. Pebble Beach, CA | August 18 -- See Cars On Line's coverage from the world's most prestigious automotive event. COL's partner website, eClassic Autos.com, provided the photos during Concours Week. Reno, NV | August 6-11 -- See Cars On Line's daily live coverage from Hot August Nights, the World's Largest Car Show and Auto Festival. Follow us as we report the winner of the first ever Barrett-Jackson Cup Award. South Bend, IN | July 17-20 -- Cars On Line attended the Buick Club of America's Buick Nationals. Over 500 cars were registered. Read our write-up on the show and some of the top cars at the event. Iola, WI | July 11-14 -- See Cars On Line's coverage from the 41st Annual Iola Car Show and Swap Meet. The theme this year was "Ford vs Chevy: Showdown in I-Town." St. Paul, MN | June 21-23 -- Read Cars On Line's live coverage from the 40th annual Back To The '50s Weekend. We have a full write-up on the show and some of the top cars at the event. Lake Geneva, WI | June 10-14 -- Cars On Line attended the Vintage Chevrolet Club of America (VCCA) Middle West Regional Meet. We have a full write-up on the show and some of the top cars at the event. Detroit, MI | March 8-10 -- Cars On Line attended the 61st Annual Detroit Autorama! Follow us as we report the winner of the prestigious Ridler Award. Plus see the "Great 8" top finalists. Chicago, IL | Feb. 9-18 -- Cars On Line visited the largest auto show in the U.S. One of the hottest displays at the Chicago Auto Show was the 2014 Corvette Stingray. Read about the new cars coming out for 2013 and 2014. Pomona, CA | Jan. 25-27 -- Cars On Line attended the 64th Annual Grand National Roadster Show! Follow us as we report the winner of the America's Most Beautiful Roadster Award. Scottsdale, AZ | Jan. 13-20 -- Read Cars On Line's daily live coverage from the 2013 Barrett-Jackson Collector Car Auction. We cover the shining moments, like the original Batmobile that sold for $4.62 million! Held in St. Louis, Missouri this year, the BCA Heartland Regionals held their annual car show and swap meet. Buick enthusiast from all around came to show off their cars and enjoy their hobby. In Reno/Sparks, Nevada holds the largest classic car and nostalgia even in the US, Hot August Nights. The show is multi-faceted with dozens of venues and activities throughout the Reno and Sparks area. In St. Charles, IL July 16-21 COL attended the Pontiac Oakland Club International (POCI) 2012 Convention. This year, the POCI introduced a laundry list of excellent activities along with influential speakers like Joe Bortz of Bortz Dream Car Collection. Take a look at our coverage of the event! In Iola, Wisconsin July 13-15 COL attended the 40th Annual Iola Car Show and Swap meet! Follow us as we take a look at the cars on display and special exhibit. In Des Moines, Iowa July 4-7 COL attended the 45th annual Oldsmobile Nationals! Follow us as we take a step back in time with these beautiful Oldsmobiles that look like they were just driven off the show room floor. In St. Paul Minnesota June22-June24 COL attended the 39th annual Back to the 50s Weekend! Follow us as we bring you the best of the best! Follow our Long Haulers as they make their way to Arlington, Texas! We saw some amazing cars during the week. Take a look at our daily updates of this year's Power Tour. We visited the longest running car show in the U.S. to see what we were in store for in the coming year. This show started on February 10th until February 19th. Racing Gremlins and fast AMCs were the fare for the 2011 AMC NAMDRA Nationals at the Cordova Raceway in Illinois. One of the best annual regional shows, with lots of great cruising, swapping and selling all jammed into a three-day show. Differing versions of transportation were on display at the 21st Vintage Transport Extravaganza in Union, Illinois. Cars On Line.com was there. Read on. We just got back from the 39th Annual Iola Car Show and Swap Meet in tiny Iola, Wisconsin. Despite the venue it is one of the biggest car shows in the world. This year they featured those "Delightful Dodges & DeSotos." Ron Hoettels brought his 1931 Bowe's Seal Fast Special No. 23 to the Milwaukee Mile for the 17th Annual Millers of Milwaukee Indy Car Event. Even the heavy rains couldn't dampen the spirit of old car lovers as they gathered at the Fairgrounds in St. Paul, Minnesota as the Minnesota Street Rod Associaton sponsored the biggest car show in the world. 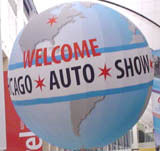 One of the hottest displays at the 2011 Chicago Auto Show was the Mercedes-Benz exhibit. Read about the new cars coming out for 2011 and 2012. Read about our daily live coverage from the 2011 Barrett-Jackson Collector Car Auction in Scottsdale, Arizona. One of the Biggest Shows in the country. MSRA Sets New Record for Registrations in 2010. Cream City Chapter BCA Heartland Regional. This Wisconsin Buick meet.